Weddings are happy occasions to celebrate a meeting of hearts between two people; between two families; and between friends. Every country has its own celebration and ritual to do with marriage and family. 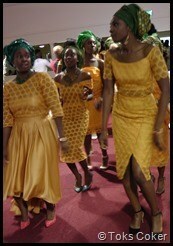 In Nigeria the families choose a colour to wear to celebrate the occasion. The colour lets you know who the family members and friends of the family are. Here I share an event I went to with the energy of the Super Full Moon in Pisces and Sun in Virgo. This wedding filled my heart with joy and made me smile from deep within me. The couple are young and beautiful. They are rich in character and blooming with hope. I am sharing this sacred event because it is a reminder of your possibilities and your potential. Never give up on your dreams. The pictures are in the order I saw everything happen. May these pictures heal you and give you hope and enable you to take action to achieve your happiness. Note which pictures move you the most. The young man waits patiently for his young lady he has chosen to be his wife. The music and line of dancing ladies announcing the arrival of the beautiful Bride, hidden behind them. The young lady has said ‘Yes’ to her life and to her handsome young man. She arrives dancing – a spectacular splendour – in gold, yellow and blue – with a soft gentle veil over her face. She is dressed in the traditional Nigerian outfit. She is just simply stunning. Money is showered on her as she dances. As she passes where are parents are sitting, she lowers her head sadly, as she is leaving her parents home and is moving in with her husband. A family member smiles at her. The daughter kneels before her father to receive a blessing from him. He starts to cry. Father hugs his daughter and blesses her silently. There is silence in the room as father blesses his daughter. Members hold their hands out sending blessings and prayers to the bride. Once the blessings are over from the Bride’s family, the Bride sits between her mother and father. The beautiful bride kneels before her future Mother in Law, who blesses her with joy. She then removes her veil and welcomes her. With arm outstretched prayers are poured on the Bride for a happy life and marriage. Once the blessings are over from the Groom’s family, the Bride sits with her new family. Guided by the MC, the Bride kneels in front of her Groom. They look into each other’s eyes and smile. He removes his cap and brings his face close to her face. They bless each other. Groom lifts Bride and sits her on his lap. She takes his cap and puts it on his head. Time to lift your lovely lady and give her a kiss, then put her down gracefully. The young wife-to-be goes to the gift table and picks one gift from the table. She gives it to her husband to be. He unwraps the gift and in it is the ring he has bought for her. He puts the ring on her finger. He kisses the ring on her finger. She dances around the room showing off her lovely new ring to everyone. She takes his cap and swings it in her hands as she dances round the room. Then she puts the cap back on the head of her husband. After thanking and greeting the family, money is placed into three bowls to say thank you to the MC. The Groom takes a relaxing picture with his new in-laws. One of the wonderful things about Nigerian weddings and engagements is the spraying (gifting) of dollars on the couple while they are dancing. The drummer is an integral part of African life. After the ceremony there was eating of wonderful delicious food.